A fabulous five day programme to this iconic motoring event hosted by TV Presenter, Tiff Needell. Tiff has been attending the Mille Miglia for many years and is a knowledgeable and enthusiastic advocate of this fabulous event. 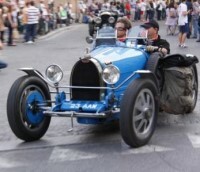 As we dip in and out of this epic 1,000 mile journey which attracts some of world's most treasured sports cars, you'll experience Italian culture and hospitality combined with superb wining and dining, transfers in the comfort of chauffeured MPVs and boutique hotels on Lake Garda and Bologna. 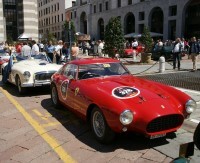 We include private visits to the Mille Miglia museum to totally immerse ourselves in all things Mille Miglia. Also a special visit to San Marino where the cars wind their way round the narrow streets of this hilltop principality. VIP Day at San Marino; includes privileged access passes, fast track cable car transfers, exclusive seated viewing, aperitivo, superb lunch and drinks throughout. We will personally meet you on arrival whether you choose to fly or drive to Italy. We spend our first night in a delightful family run hotel overlooking Lake Garda in the picturesque, charming town of Desenzano. Around 4pm we all meet for an informal welcome with drinks and canap?s hosted once again by Tiff Needell, TV presenter and Mille Miglia enthusiast. Then it's on to our private tour of the Mille Miglia Museum, a converted monastery in Brescia, with dinner served in the museums own trattoria. Back to Desenzano for lunch overlooking the lake. 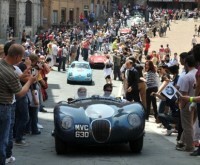 Watch the Mille Miglia cars pass at speed on the first leg of their epic journey whilst enjoying drinks and desert from our private balcony and terrace. 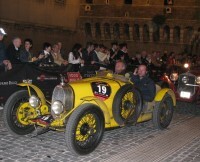 As the competitors race to their first overnight stop we follow in their wheel tracks in the comfort of our chauffeured vehicles arriving at our boutique hotel in the mediaeval centre of Bologna. Drinks with at our favorite Italian bar round off a busy day. We arrive by cable car into the ancient hill top Republic of San Marino where the narrow steep streetsand sharp turns bring the Mille Miglia cars to our exclusive seats where they pass just feet in front of us. As invited guests of the Republic we will enjoy Italian hospitality at its best with a superb lunch as we soak up the atmosphere of this unique leg of the race. Later that day we head back to Bologna where this evening we enjoy a casual supper just a few minutes from the hotel. Today we have an informal walking tour of beautiful Bologna, in small groups our vibrant guides take us through the wonderful quaint cobbled streets, giving a fun insight into a fascinating city. We meet for a light lunch in the heart of the food market and then the remainder of the afternoon is at leisure with time to relax, or join our optional, exclusive behind the scenes at Lamborghini with private guided tour of the production line and museum. Details on request. We say farewell over dinner at the fabulous "La Bottegada Franco" where the same family has run this rustic restaurant situated on the outskirts of the city of Bologna for 70 years. Check-out of the hotel after breakfast with some time to enjoy a final cappuccino overlooking the Piazza? Executive transfers will be provided to your departure airport or to take you back to Desenzanoto collect your car. If you want to extend your stay we will be happy to make the arrangements on your behalf. We do offer a totally flexible flight booking service through our ATOL licensed partner. If you would like us to investigate flights, please let us know. If you require a shorter or longer programme this can be arranged, please call us.